The script’s movie potential is best described as Last Of The Mohicans meets Braveheart. A down-and-out, young George Washington — desperate to join the British Army — accepts a dangerous mission to conquer a French fort and save the American colonies. Wait, mid-six figures? Geez, maybe we really should get on that Southern Campaign script. The last time I went to Colonial Williamsburg, I was sitting in the capitol’s courtroom and listening to the guide give his spiel on eighteenth-century trials, when it suddenly hit me: Americans lived under a monarch before the Revolution. I don’t mean that I didn’t know this before, of course; I mean that it hit me viscerally for the first time. I’d never felt so distant from the inhabitants of eighteenth-century America as I did at that moment, sitting in that reconstructed courtroom where men—where subjects—dispensed justice under the aegis of a crown on the far side of the Atlantic. This was no simple political status, but had all sorts of social, cultural, and even psychological implications. As clarified by Sir Edward Coke and other jurists in the seventeenth century, the allegiance the English subject owed his monarch was a personal and individual matter. Diverse persons related to each other only through their common tie to the king, much as children became brothers and sisters only through their common parentage. Since the king, said William Blackstone, was the “pater familias of the nation,” to be a subject was to be a kind of child, to be personally subordinated to a paternal dominion.…The whole community, said Benjamin Franklin in 1763, is regulated by the example of the king. The colonial past, in short, is a foreign country. Or at least it is here in America, where we don’t much stock in personal ties to a monarch anymore. One part of the process that was particularly concerning for Blunt was renouncing allegiance to Queen Elizabeth. “I had to renounce my Queen!” Blunt said. This emotional and personal sense of investment in a monarch is something that seems strange to Americans, but would’ve been familiar to our colonial predecessors. Blunt’s vexation over having to renounce her queen might help us understand why so many Americans hesitated to take that last, fateful step toward independence—and why some of them refused to take it at all, deciding instead to fight, go into exile, and perhaps die for their commitment to their king. Renouncing Parliament was one thing; renouncing the monarch was something else altogether. Oh, and as long as I’m on the subject of Emily Blunt and the British monarchy, let me recommend the 2009 film The Young Victoria. It’s a very good movie, and Blunt is outstanding in the title role. *Honestly, though, if your first taste of American citizenship was Trump’s hair on TV, wouldn’t you be having second thoughts too? It’s going to be a John Sevier September at Marble Springs! This month will mark 200 years since John Sevier’s death, and we’ve got a whole slew of things going on at Marble Springs State Historic Site. Sept. 19-20 is our annual living history weekend, John Sevier Days. This is one of our most popular events, with reenacting, period demonstrations, interpretation at our historic buildings, and more. Sept. 19th is also the night of our third Sevier Soirée, the annual fundraising dinner and silent auction that I posted about not too long ago. Tickets are $50.00 per person, and include open-hearth appetizers, a Southern-style dinner, and live music by Guy Marshall. Reserve seats by Sept. 14th, either via snail mail or online. On Sept. 24th, the actual anniversary of Sevier’s death, we’ll have a special one-time commemorative event. 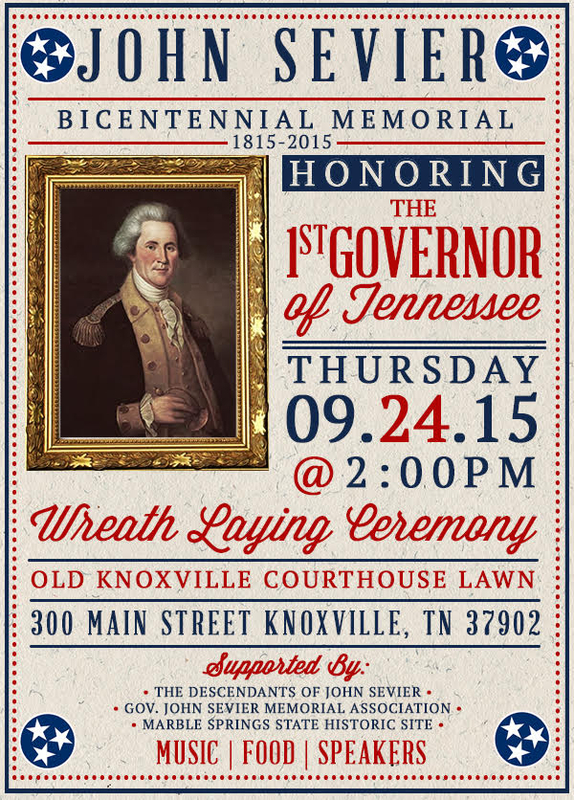 At 2:00 P.M. we’ll be doing a wreath-laying ceremony at Sevier’s grave on the lawn of the Old Knox County Courthouse in downtown Knoxville. Thanks to a generous benefactor, we’ll also be hosting a cocktail event at Marble Springs at 7:00 that evening, followed by dinner. This will be a very special month for aficionados of Tennessee history, historic sites, the American Revolution, the early frontier, good food, and good music. Hope to see some of you there! Everybody loves the new musical about Alexander Hamilton, including a lot of prominent historians. If Hamilton seems an unlikely subject for a musical, keep in mind that this isn’t the first time somebody has set the Founders to music and put them on a stage. One of the all-time best films about the Revolution originated as a Broadway show. The first time I saw the movie version of 1776, it was totally by accident. This was back when I was a teenager, before I’d developed any kind of serious interest in history. In the summer I used to stay up to watch Letterman and the other talk shows, and then I’d flip through the channels for a while before dozing off. One night (or in the wee hours of the morning, I suppose) I happened to land on a movie channel right before 1776 came on. Next thing I knew the stodgy figures from all those old paintings were alive—bickering about the heat, swapping insults, longing for their wives, and occasionally bursting out in song. It humanized the Founders without diminishing their achievement, it was hilarious without trivializing the events it depicted, and it somehow made the unfolding of history seem contingent and uncertain. I don’t know why I got such a kick out of it; I wasn’t a fan of American history or musicals at the time. But now that I look back, seeing that movie was one of the things that got me interested in the American Revolution. Seeing 1776 didn’t turn me into a history nut overnight, but it was definitely a step along the road to where I am now. Maybe if I’d been in the habit of going to bed at a decent hour, I’d be in a different line of work. On a related note, the Spanish version of Evita with Paloma San Basilio is so good it’ll knock you right on your keister.